Whilst having a stoma might have its challenges and take a bit of getting used to, for me it truly is a blessing and has given me my life back. 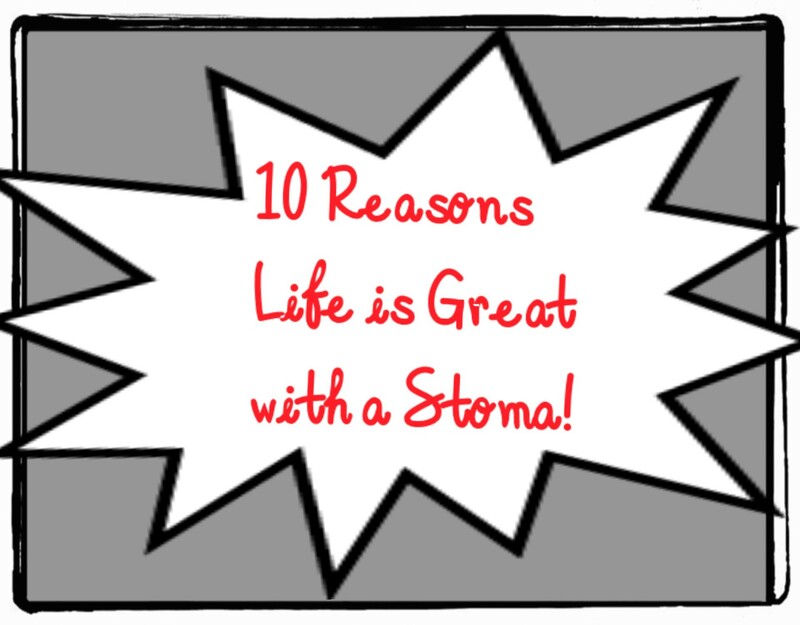 So here are my TOP 10 REASONS LIFE IS GREAT WITH A STOMA! 1. FREEEDOM!!!! No longer does life revolve around being close to a toilet. No longer are the bathrooms the first thing you scope out whenever you go anywhere. You can do all those things you love without the fear of having an accident. Your sense of freedom returns as you return to doing all those things you love but perhaps can’t do in the middle of a bad IBD flare. Overseas holidays, concerts, road trips, going for long walks, shopping, going out for dinner … all become so much easier. 2. You can LITERALLY POO ANYWHERE!!! I love the fact that you can go anywhere – on the train, sitting at your desk at work, in bed, at the dinner table, midway through a conversation! And unless he decides to get a little noisy, usually no one is the wiser!! 3. Having a stoma means LESS of so many things that you want less of. Less doctors and hospital visits, less medication, less side effects, less pain, less anxiety, less worry, less reliance, less stress. Less of these things means MORE of the good things. More independence, strength, resilience, money in the bank account, confidence, and more time and energy to spend on better things! 4. A licence to tell as many FART and POO jokes as you like! 6. A HEALTHIER and HAPPIER life. For many of us a stoma is lifesaving. You have probably suffered with a serious illness, whether an IBD, bowel cancer, or something else, and ostomy surgery was needed to make you better. Having a stoma can be tough and difficult to adjust to, but hopefully for most of us, surgery leads to a significant improvement in our overall health and quality of life. The World Health Organisation states that “better health is central to human happiness and well-being”. Being healthy definitely contributes to our happiness (and vice versa). 7. An excuse to EAT JELLY BEANS!!! If your output gets a bit too liquid and runny, you have the perfect excuse to eat jelly beans, and PEANUT BUTTER and MARSHMALLOWS!!! Or any of the other awesome foods that help thicken our stool or slow output like cheese, bananas, apple sauce, rice pudding, pretzels, yoghurt and mashed potato! Do remember though, a balanced diet including all food groups is important too! 8. We win TOP PRIZE for the STINKIEST POOS! If “most stinky poo” existed in the Guinness book of World Records, an Ostomate would definitely take out the title! Okay, so this may not be a GREAT thing (in fact, it can be a downside to having a stoma), but there’s not a great deal we can do about it, so may as well make the most of it!! In a weird way, I have an odd sense of pride in having the poo with the greatest perfume in my household. I have to giggle when Michael walks into the bathroom after I’ve just emptied my bag, complaining about the stench. Hehe, let’s just call it payback for all his stinky farts and for the many times he has ponged out the bathroom for me! And nowadays I would definitely beat my sister in the farting competitions (on sound and smell) we used to have when we were kids!! 9. An OPPORTUNITY to share your experiences, help others, spread awareness, increase understanding and meet lots of likeminded awesome people in the process. 10. A greater APPRECIATION for life and understanding of personal values. Most of us with a stoma have been through some pretty life changing experiences and hardships, with our health, careers, relationships and life in general. I’ve done a lot of soul searching in the lead up to and since having my ostomy surgery. I definitely appreciate life more, and especially value the little things. It’s helped me reassess my priorities and reevaluate what is really important to me (for the better). I have closer and stronger relationships with those I love, and a greater sense of gratitude for life and the joy of living. And all those reasons (except perhaps the stinkiest poo one!) apply equally as reasons why life is great for mother of person with stoma! Life is certainly SO much better than it was for years pre-stoma! We are truly blessed and blessed also because your stoma has been so trouble free. Life is indeed good! Hi Roy, I also read a real mixture of both success and horror stories before my surgery. I know I’m very lucky in that so far mine has been one of the good ones, but of course, that didn’t stop me from having a lot of concerns pre surgery. If only we had a crystal ball! You do have to be incredibly careful with any heavy lifting or labour intensive work not to give yourself a hernia. There are support belts and things you can use to help avoid this, and you should talk to the surgeon or stoma nurse about this. I have a desk job and have never been a big exerciser, so it’s not been an issue for me. To be honest, I still worry about the smell sometimes! Not of the bag itself (it doesn’t smell at all), but whenever I empty my bag in a public bathroom. Ostomy poop has a completely different smell to normal poop! Again, there are heaps of products you can get to help hide the smell though, so you shouldn’t let it concern you. As they say, everybody’s poop stinks! Good luck with your decision. It’s always a good idea to get a second opinion even just for peace of mind. All I can say is that I am so much healthier and happy now than I was in the 4 years before my surgery. All the best, Laura x P.S Happy to hear you rant any time! !